Nici Wonderland clothing is available for our sweet cozy cuties. Whether you want to take a trip to grandmothers, play on the swings or listen to a short story, there is just the right ensemble to choose from. In this set you’ll find the perfect accessory for the sweet ballerina. It comes complete with a soft tiara, tutu, gaiters and of course fairy wings. Will fit any of the Wonderland 30 cm dolls. 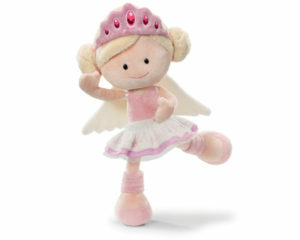 Set comes complete with a soft tiara, tutu, gaiters and fairy wings.